Samsung’s flagship handset, the Galaxy S9+ has got an official price cut in India. 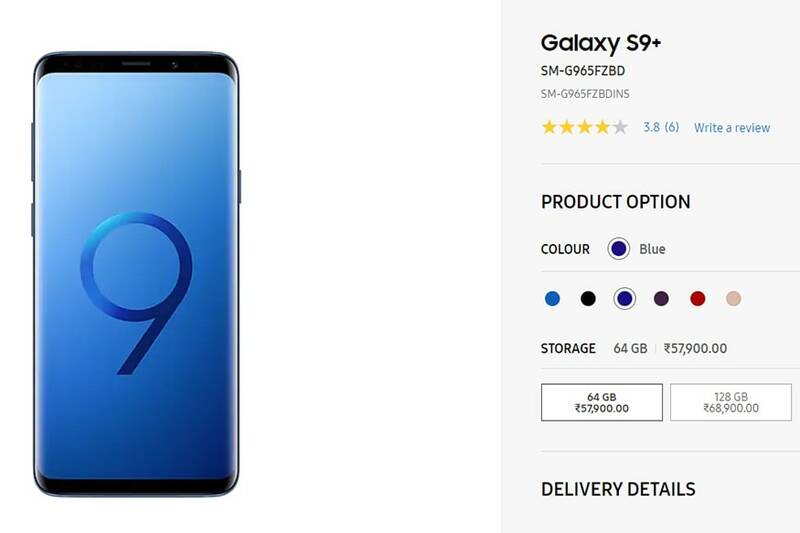 While the company hasn’t officially announced the price update, the online store now shows that the 64GB variant of the S9+ is now available at Rs 57,900 instead of the original Rs 64,900 price tag. This means a drop of Rs 7,000. Notably the price cut is applicable for all colour variants, although you can only buy the Black, Blue, Purple and Red colours as of now as the new Polaris Blue variant is currently out of stock. Notably the Sunrise Gold colour option is only available in 128GB which also sees a price cut from Rs 68,900 to Rs 61,900. There have been reports that Samsung has also cut prices of the S9+ if you buy the device from offline stores. The Galaxy S9+ is powered by Samsung’s Exynos 9810 Octa-core processor based on the 10nm architecture. There is 6GB RAM, with options of 64GB, 128GB and 256GB of internal storage, all of which have expandable storage options. You get a 6.2-inch curved Super AMOLED display, with a 2960×1440 resolution which is probably the best panel you can get on a smartphone. There’s a dual 12-megapixel at the back with variable aperture options as the user can manually choose between f/2.4 or f/1.5. The second camera offers 2x optical zoom, while other features include 4K video recording along with a 960fps mode, Bixby AI that can recognise buildings, locations, objects and more, and AR Moji which is the company’s take on Animoji which was launched by Apple. At the front there is an 8-megapixel camera with f/1.7 aperture. Other features include fast charging, fast wireless charging, waterproof and dustproof certification, headphone jack, microSD card support, and so on.